Urban Chic meets Modern Mediterranean Inspiration at Copper Leaf Villas where you can LIVE Life | WORK Smart | PLAY Hard. 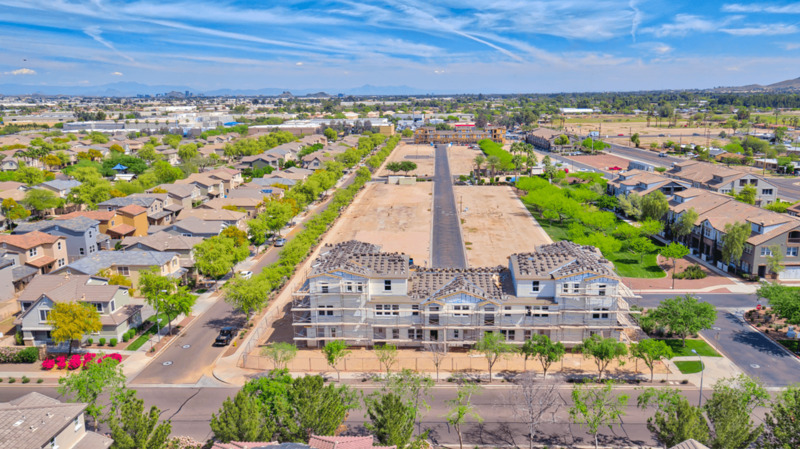 This new community is located at NW Corner of 24th Street and Southern Ave. and consists of 155 Condominiums with 5 Different Model Floorplans, up to 3 bedrooms, 1 and 2 ½ baths and 2 Car Paneled Garages. The floorplans are designed to delight, offering between 883 -1371 square feet of open entertaining space with picture windows, spacious great rooms that flow back and forth into the dining areas, and stylish kitchens featuring islands for buffet style dining with family and friends. Master bedroom retreats offer view decks, walk-in closets, double vanities and standard upgrades including steel tubs, marble shower walls and modern marble square sinks as well as Moen Faucets in Polished Chrome. Select condos also have Private Courtyards. Our homes maximize livable space with impressive great room and options to create an urban indoor outdoor living feel to private courtyards on select condos. Plans include features such as 8’ Front Doors, 9’ Ceilings on 1st & 2nd Floors, 2 Panel Colonial Doors, 3 ¼ Baseboards, Ceiling Fan Prewires and Garage Door Opener with 2 Remotes. Dual Pane Low E – Vinyl Frame Windows & Patio Doors and Energy Star Features can save you up to 40% on electric bills. Optional Upgrades – Waterfall Kitchen Island, Showers w/Tile Surrounds and Frameless glass shower doors. Additionally, there are “SOPHISTICATED WITH A SLANT” upgrades on the homes include Designer Lenox Sleek Cabinets, Granite Countertops with under-mount Stainless Steel Sink, choice Luxury Urbanality Vinyl Plank flooring, in kitchen, bathrooms, laundry and entry. We also offer a Stainless Steel Appliance Package.